Fixture selections will play a significant role in your bathroom's overall plumbing design. Much more so than your kitchen so we will concentrate in there for now. Once you think you have your desired fixtures selected, it is time to put your design on paper. Space will also play a major role in the type and quantity of fixtures that will fit within your plumbing design. If you are working with a small or odd shape, try thinking outside the box. Ideas for remodeling a small bath may include a neo-angle shower as opposed to the standard square or rectangle. Or maybe a whirlpool is placed kitty corner to take up a small niche space. This will help free up floor space in your plumbing design. If you have been considering having a toilet and bidet but just don't have room, you may want to investigate a multi-function unit such as the Neorest Toto toilet. Plumbing fixtures have taken a major leap over the last decade when it comes to design styles. Along with kitchens becoming a major hub and center of activity, bathrooms have become a place of relaxation and spa like atmospheres. Most manufacturers have recognized the need to accommodate these changing lifestyles and market trends. And that is what selecting plumbing fixtures should be all about; your lifestyle and how you see them fitting into it. When making fixture selections today, you can now completely express your individual design creativity as there is so much more to choose from. From the futuristic sleek shapes of contemporary to the elegant more classic profiles of traditional they are all available in a multitude of finishes. Carrying out a master piece is easy today with most manufacturers creating ensembles. These themed groupings bring continuity to your plumbing design by coordinating everything from fixtures to accessories to mirrors and lighting. In addition to style and price, one must look carefully at the available options and performance. Yes even toilets come with options these days from auto seat raising, flushing and washing to heated seats it's all out there. 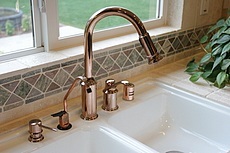 In the kitchen, sinks and faucets have also come a long way. There are so many sizes and shapes to pick from it can make your head spin. There are many, many different multi- bowl configurations to choose from with lots of accessories like drain & cutting boards made to fit the individual sink. Pot fillers, instant hot water dispensers and faucets with pullout sprayers also add to the ease of preparation. Well known companies like Kohler are now offering integrated cook/sink combination centers. Amazingly you can fill, cook and drain water based meals at one convenient location. Researching the available market is key to having not only an esthetically pleasing plumbing design but one that also functions with maximum flexibility. With today's busy lifestyles simplifying the process can go a long way and it does not have to break the bank. Even if you are working with a designer, do some busy work yourself. Go to plumbing showrooms and large home centers. Familiarize yourself with what is out there and what the associated costs are. This will make sitting down with your design professional and selecting your fixtures a whole lost easier. Be sure to have also researched your plumbing fixture budget as it relates to the entire project. There are so many fixtures to pick from in so many price ranges. If your budget is really tight, you may want to try online sources they are generally less expensive especially those offering free shipping. Knowing what allowance you are working with will streamline the process and allow you to buy the best fixture for your money.